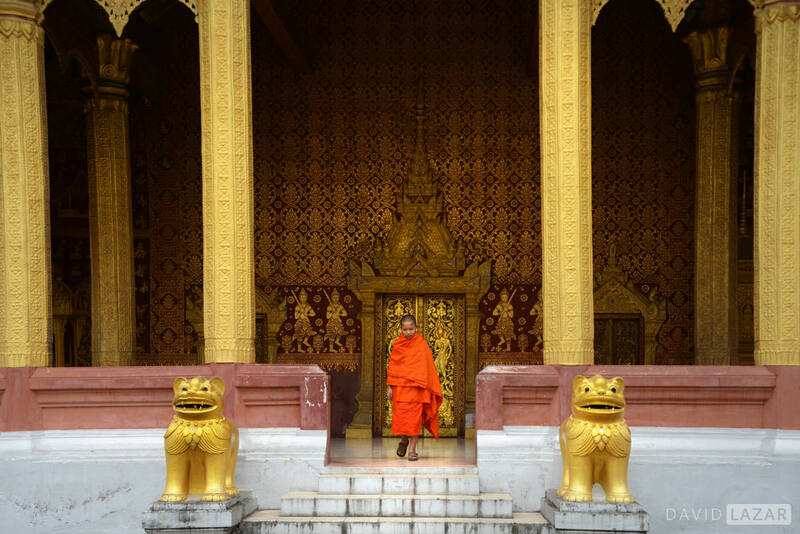 In early 2018, a renowned fine art travel photographer David Lazar took up a 10 day challenge – to successfully photograph what many consider to be over-touristed areas of Thailand, Laos and Cambodia. David was keen to open up a Southeast Asia photo tour workshop, (to include Vietnam), convinced it still had a lot to offer and was currently being underserved. Not too long ago, the region was in huge demand by photography enthusiasts, but that demand has waned in recent years. The number one reason cited was that they had already “been there, done that.” The number two reason was the perceived general overabundance of tourists, which they thought would severely limit their photo opportunities. As an experienced professional, David was not the slightest bit deterred by these concerns and was excited to get started. As long as the popularity of certain destinations persists, the demand for new and compelling images from travel and in-flight magazines will persist. A necessary part of the travel photographer’s job description is the ability to capture beautiful and creative images in popular and even over-crowded places. Places like the Taj Mahal or Eifel Tower have been photographed billions of times, and yet the demand remains, especially for something “new”. There is no limit to creativity and possibility, and it should be considered a positive challenge to any photographer worth their salt, not a negative excuse to stay away. Any good travel or culture photographer will tell you that returning to certain places again and again is an essential aspect to developing their best work. Re-experiencing destinations for which you have an affinity very often becomes more rewarding with each visit. Of course you can get some excellent images on a single trip, but generally speaking your best work will emerge as you dig deeper over time. For David’s 10-day challenge to prove successful, he knew he would have to answer the two main concerns expressed by amateur photographers above, and that these answers would be most effectively expressed in images. I chose the Southeast Asia itinerary based on both iconic and promising off-the-beaten path locations within two hours’ reach of the major sites. Then I made a list of tactics and techniques I could use in order to meet the challenge. Of course more than one tactic and/or technique might come into play in any given situation. I hope you enjoy the results from this trip. They will only get better with each return visit! To beat the crowds, the sunrise, and/or get a great position. The village of Damnoan Saduak is riven with waterways and is a very popular tourist destination near Bangkok. When David showed his Thai guide a similar image to the above taken by Art Wolf, she not only said it was “staged like Hollywood”, but that it would be impossible to capture these days. Never one to take “no” for an answer, he set out well before dawn the next morning. Clearly she was not correct. The key in this case as in many, is beating the dawn on the way there, and being first on scene. There are numerous other image opportunities around the waterways as well, where few bother to explore. 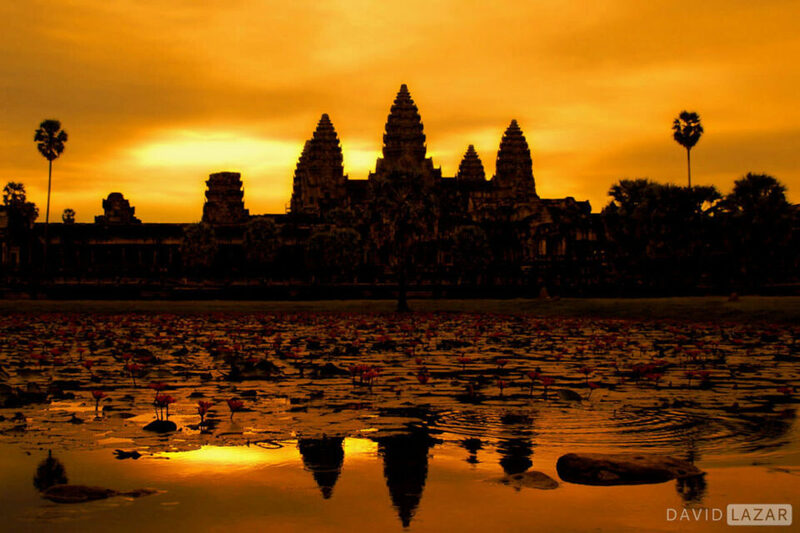 At Angkor Wat everyone tries to beat the dawn! So if you are keen on getting lucky with the light for this classic angle over the lotus pond, you have to beat it a little earlier to get prime position for your tripod. Bring coffee and croissants. A million people might be there but if they are not in your frame, they don’t exist. 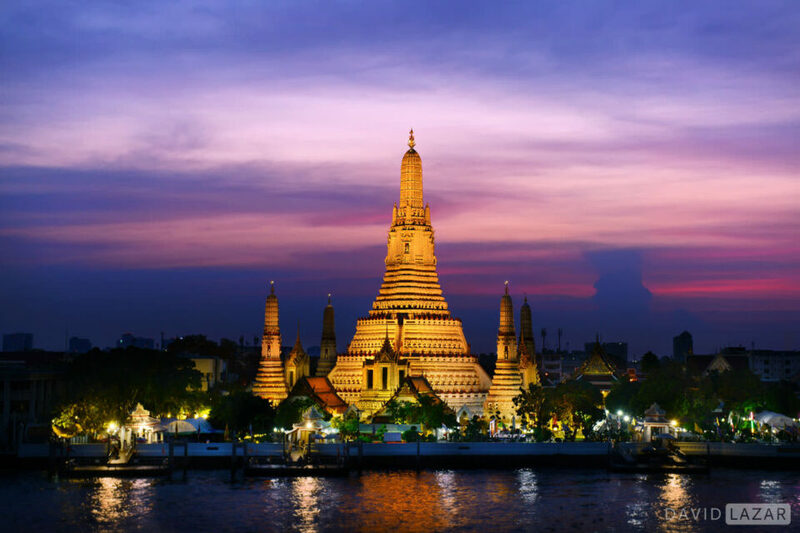 Blue hour @ Wat Arun, Bangkok, Thailand. Taken from between tables at a crowded bar on the Chao Phraya river, sans tripod. The fireworks show is schedule to return to here on December 31, 2018. 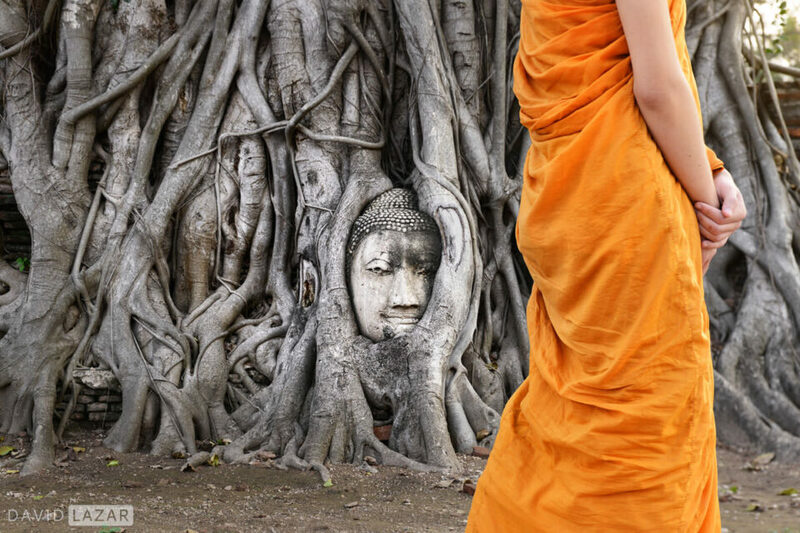 Rooting for the Buddha, Ayutthaya, Thailand. The UNESCO World Heritage site of Ayutthaya is understandably a popular tourist destination. The Buddha head wrapped in Banyan roots was first made famous by Steve McCurry decades ago when the site was not well known outside of Thailand. These days there are always visitors milling and posing and moving on, plus you cannot get any closer to it than from where David kneeled here. This is where patience comes in, even more than framing, as you can shoot wide and have space to crop and clean up any clutter later. In this case the monk was waiting for a small crowd to clear so he could approach the shrine, and David was able to take advantage as he passed. The Bayon, Siem Reap, Cambodia. Large crowds are impossible to avoid during high season in the Angkor Wat area these days, but you wouldn’t know it from this shot! There are numerous heads of tourists taking photos just under the bottom of the frame. Monk exiting monastery temple, Luang Prabang, Laos. The picturesque town is Laos’s most popular tourist stop, but you wouldn’t know it by this picture. The tourists are simply out of frame. 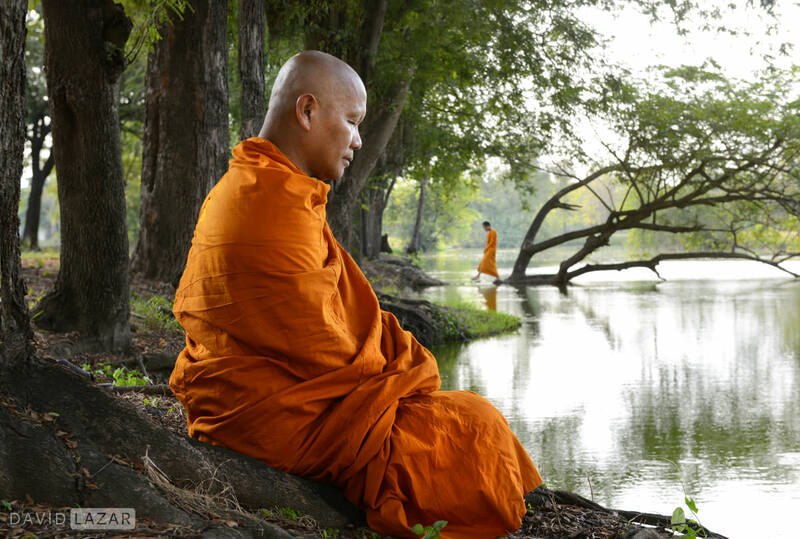 See monk enter, imagine the exit shot, position, and wait. And hope nobody walks into the frame at the worst possible moment! To be in choice places when others are not. If the crowd normally goes to a particular place at a particular time, find another place! You never know when another unexpected gem might reveal itself. Kayan woman framed by her creations, tribal cooperative, northern Thailand. This village is on the tour bus route, but most tourists don’t arrive until late morning or afternoon. There was a group there when David arrived, but when they went left he went right! And didn’t see any of them for quite some time. Never an issue. Side Note: Don’t listen to those who insult Kayan woman by calling them “human zoo animals”. It’s not only flat out rude, it’s ridiculous. 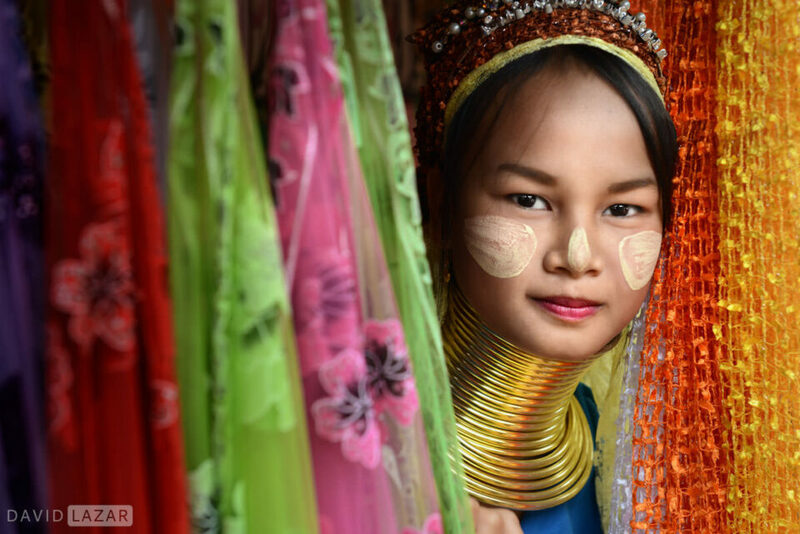 The Kayan (commonly and somewhat pejoratively called “Padaung”) are refugees from Myanmar that have been in Thailand for decades. While it’s true many have been put together with other poor hill tribes to form cooperative villages to reap the rewards of tourism, (why shouldn’t they? ), it’s NOT true they have done so against their will. It’s not an ideal situation due to Thai government restrictions on many of the Hill Tribes, and they do not receive much from entry fees. But they choose to stay because it’s better than a subsistence living deep in the mountains or the rough conditions of a border refugee camp. These are working villages where the people live, raise their kids, and make and sell their wares. David had a wonderful time interacting with the various tribal peoples this day, and especially with the charming Kayan. And that’s the key – when you go don’t go as a gawker. Respect, engage and enjoy. Water blessing, Siem Reap, Cambodia. Khmer pilgrims receiving a water blessing, very near the crowded Bayon. Lao girl outside of Luang Prabang, Laos. While the crowds (actually fairly light in Laos) enjoy the town and the usual tourist fare, welcoming, rarely visited tribal villages are not far away. Use your camera to creatively take advantage of the crowd with motion blur, zoom blast, panning, and depth of field. Veering east and away from the “challenge” for this category, David decided to employ motion blur to blend the crowd and add an element of movement. He used a tripod at a slow shutter speed to blur moving people. For most slow shutter shots with people, you want at least one person who is still and stands out sharply. 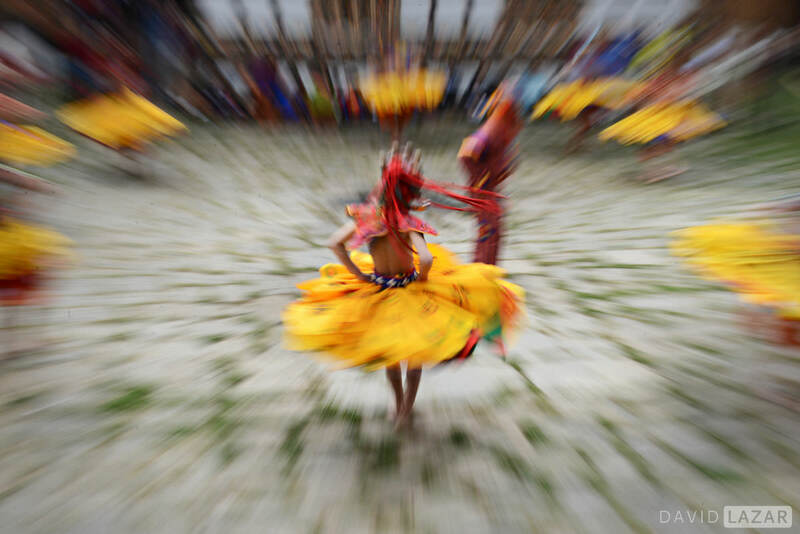 In this case with people milling more than walking, David wanted to use a longer shutter speed of 5 seconds to give enough time to create motion blur. At f/14 the lady meditating in orange as well as the pagoda would be acceptably sharp, and an ISO of 125 kept the light to the sensor in check, with the result being a near perfect exposure. This was taken at the 2018 Domkhar spring festival, with settings of 1/30 sec, f/20, ISO 400. The technique is known variously as zoom-blast, zoom-burst or zoom-blur to create a sense of motion and/or abstraction. To perform the technique you need a zoom lens. Zoom in and focus lock on your subject with shutter priority ranging from 1/30 for moving subjects to 4 seconds for stationary subjects. Press the shutter release and zoom out! The faster your shutter speed the quicker you need to zoom out, and vice-verse. It takes patience and practice to get an image that really works, especially with moving subjects. There are a number of variations you can try with zoom-blast, including blasting in instead of out, and getting more psychedelic by rotating the camera during the zoom. Other crowd blending techniques include shallow DOF using a long zoom and a near subject, or a short zoom wide open with near subject and crowds at a distance. Panning on a moving subject can also blend crowds and really make the subject pop when you get it sharp. With a little extra effort it’s remarkable what gems you can discover nearby major locations that tourists don’t know about. It just takes a sense of adventure and a willingness to engage with locals. 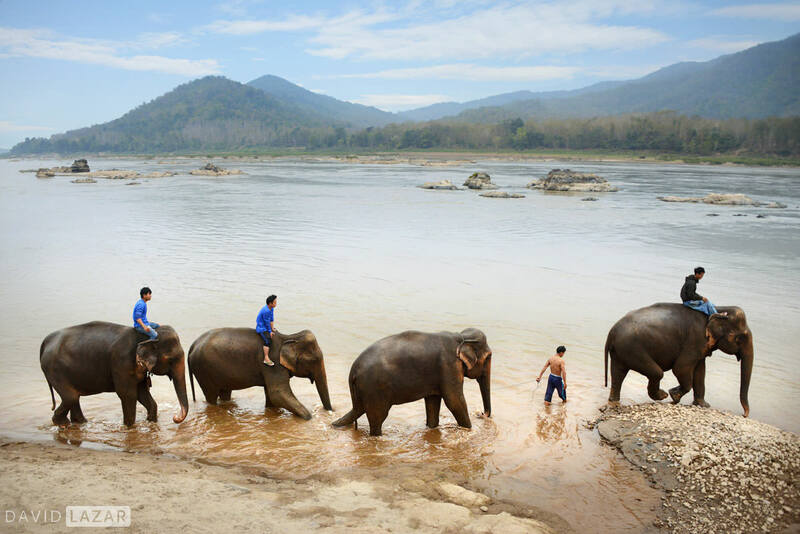 Mekong Elephants and Mahouts, Laos. Not too distant from the popular town of Luang Prabang. Rock of ages, rural Cambodia. 12th century Khmer rock carving of the god Vishnu God and his wife. 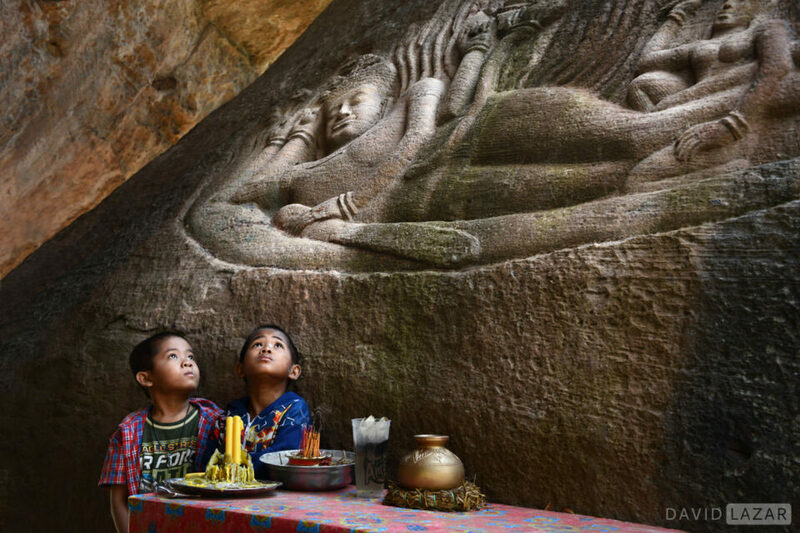 It’s located near Kunlun Mountain 80km from Siem Reap, along with a few other rock carvings. Tourists are very rare – so rare in fact that the family who tends the place doesn’t sell so much as a bottle of water! 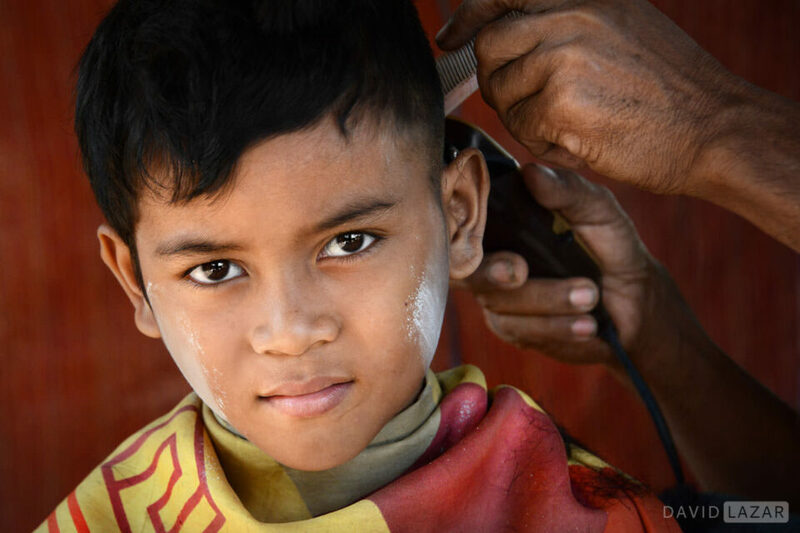 Khmer boy getting a roadside haircut in a small village an hour from Angkor. The price was 3,000 riel, or about .75 cents. Family moment, Tonle Sap delta village, Cambodia. Mom is checking for lice while the cups on the father’s back are pulling toxins from his muscles to the surface. It’s a Chinese treatment that dates back millennia. 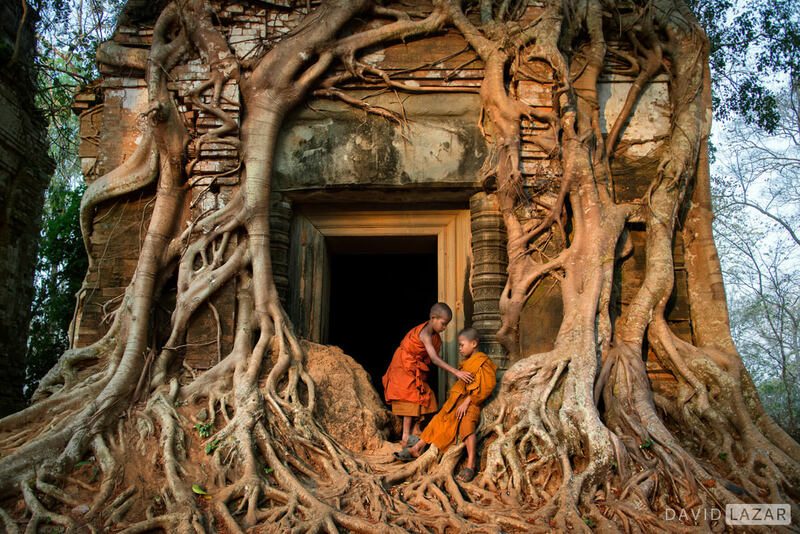 Novice monks at ancient Khmer temples, rural Cambodia. 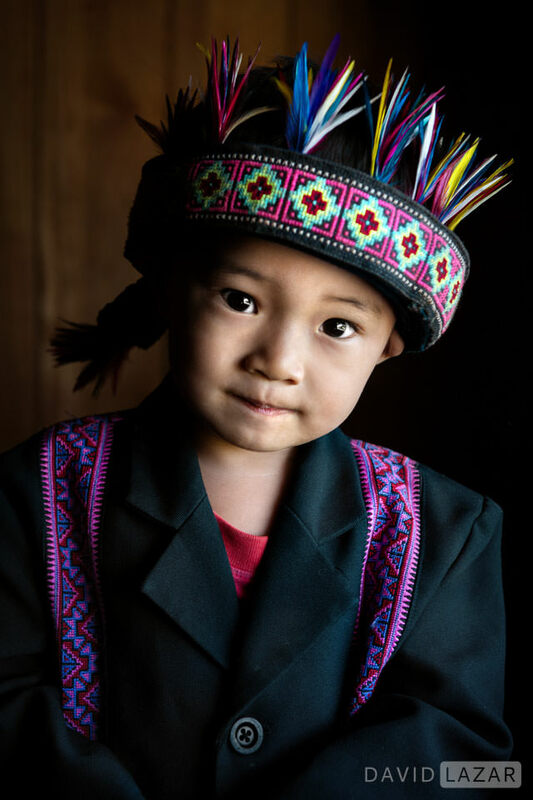 Akha toddler in his finest portrait duds, south of Chiang Rai, Thailand. There are still a number of traditional villages in northern Thailand that an intrepid photographer can access, contrary to popular belief. While some are quite remote, others are not far off the beaten path. 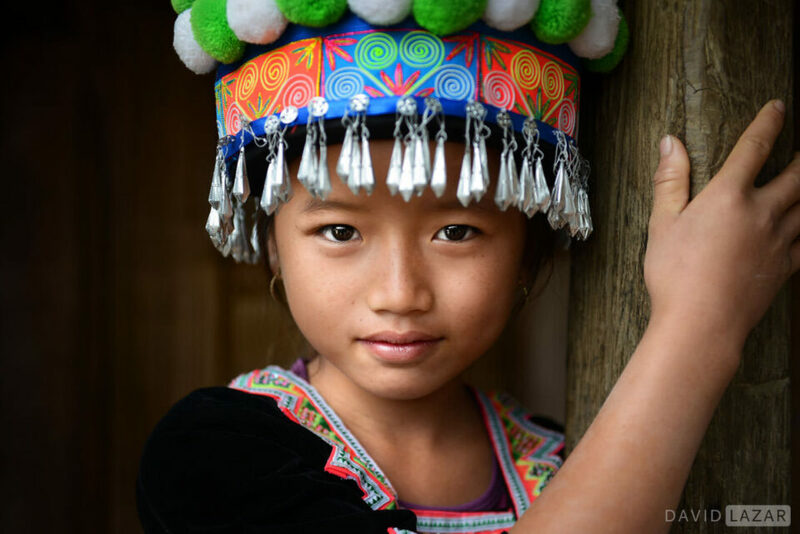 Villagers told David he was the first photographer ever to visit them, and invited him back next year (with his group) for a traditional Akha celebration with music, dance and feast. He will be bringing copies of the images he took of them as gifts, which is always a very much appreciated gesture for a retuning photographer. 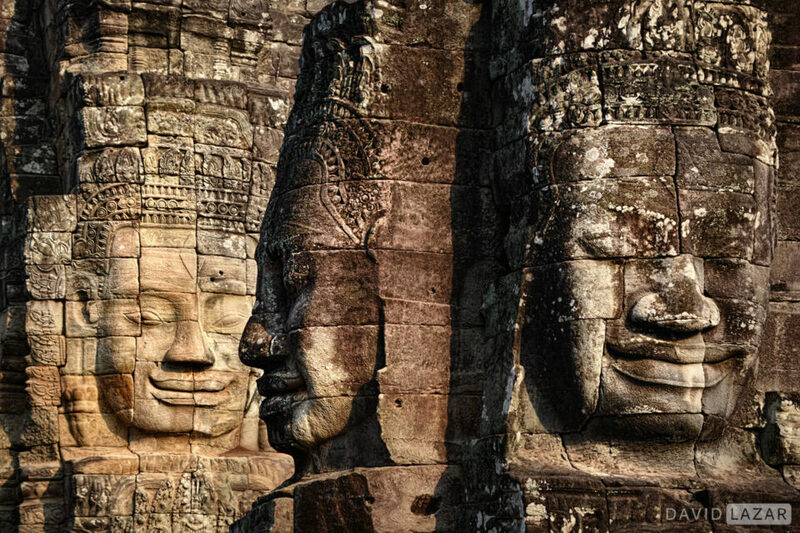 While Thailand in general and Angkor Wat in particular can pose difficulties with crowding, we have seen through the lens of David Lazar that such locations can be managed to one’s advantage. Combined with off the beaten path research and exploration within reach of major sites, the tactically creative photographer stands to be very well rewarded for his or her efforts. 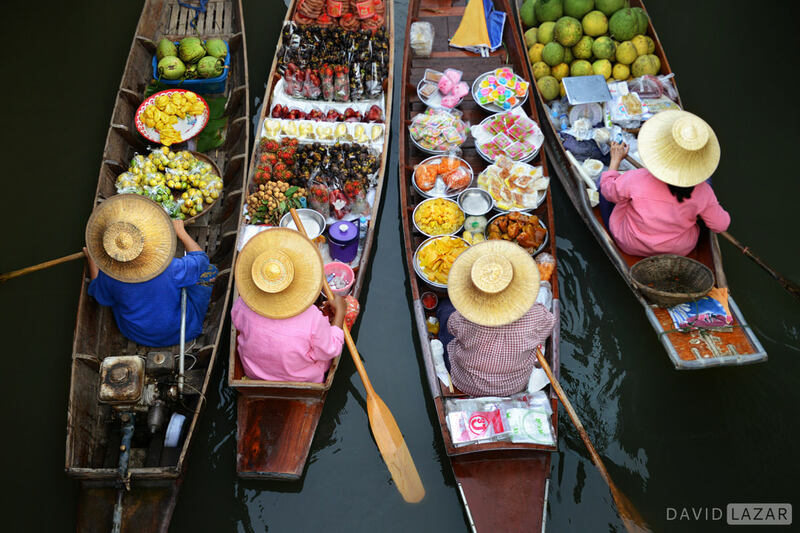 The heart of Southeast Asia remains a vibrant, colorful and culturally rich region worthy of any passionate travel photographer’s attention, beginner to professional. David Lazar is a fine art travel photographer from Brisbane, Australia. His award winning travel images have appeared in top tier publications around the world, including National Geographic, Lonely Planet, Practical Photography, and Australian Photography, just to name a few. 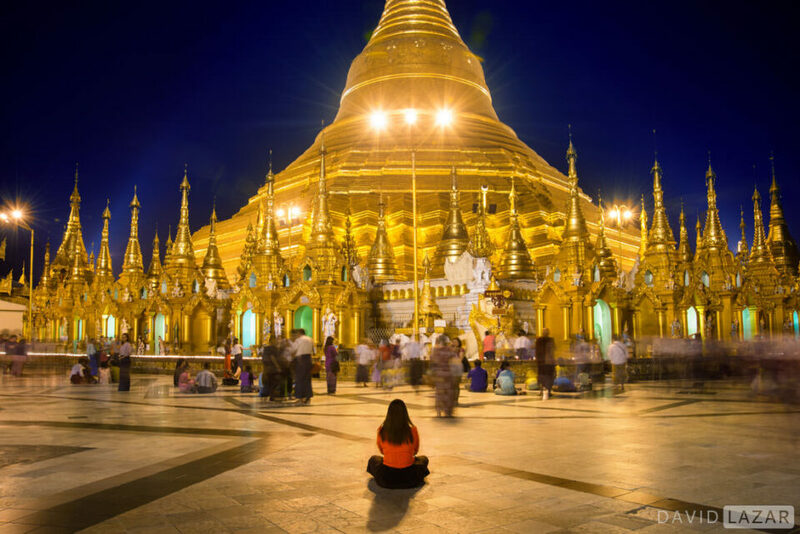 He also conducts highly praised Asia photo tours several times a year. Great photos, good tips to avoid the crowds. A place I would like to visit. Thanks for the information. Great snaps . photographer’s patience is commendable. These are magical images and stunning to view. I’m curious to know when Bennett goes to these remote areas to photograph very personal images of families, does he respectvully compensate them in some way? How does he approach these folks in a respectful way? Does he have a guide with him? I find myself reluctant to “invade” their personal spaces. Same question here, especially regarding images with kids. Are locals okay with photographers taking shots of their children? Do you have to ask them in advance? Thanks for your feedback and I’m glad you enjoyed the article about my SE Asia travel photography work. I approach the local people with much respect and always engage with them and try to get to know them a bit before asking to take a photo. In some cases, such as in the tribal photos, compensation was given for their time and efforts, and that was sometimes in the form of purchasing from their shop if they are selling something (such as the long neck lady). In other cases, such as the Akha tribe boy at the end of the article, a donation was given to his family who were very helpful and obliging to let me take some portraits of the family. I was with a guide for some of these moments, but not all, depending on the location and difficulty of access. Oh my gosh, thank you for reminding us that there’s a lot more to photography than just being in unusual locations and pointing the camera! Thank you Bennett. A stunningly beautiful and inspirational set. A lesson I got out of this is that we can choose what we see and photograph. Crowds may be ugly, but there is beauty all around, sometimes right next to or within the crowds. Even here in San Diego. Bennett, great photos and story. I have a question for you and other more experienced photographers. In the shooting data below some of your photos the shutter speed is often listed as something like 10/5000 or 10/1250. What does that mean? I’ve only ever seen shutter speeds noted as 1/something. I see this quite often on this site and can’t find any reference to what those actual shutter speeds mean. Is 10/5000 the same as 1/500? It’s been mentioned before but I believe it’s a bug in the EXIF reading software used. So 10/2500 is 1/250, etc. Great article, Bennett. I often feel frustrated just thinking about how many people are going to attend the sight I want to shoot, but we should constantly be reminded that it’s a cheap reason to miss a great shot. Thanks! Very nice pictures and story and I enjoyed reading it. I also find it interesting although I’ll likely be unable to do such myself as I’d be traveling with family and I am not selling any photos. All very nice but I thought you were going to show me how to take photos in crowded places like near the Eiffel Tower or around the Coliseum in Rome. or at the Empire State Building. The crowds are large. I want to take photos without those crowds.